The Eastern Ghats or Pūrva Ghaṭ, (Hindi: पूर्व घाट) also known as Mahendra Parvatam in the south, are a discontinuous range of mountains along India's eastern coast. The Eastern Ghats run from the northern Odisha through Andhra Pradesh to Tamil Nadu in the south passing some parts of Karnataka. They are eroded and cut through by the four major rivers of peninsular India, known as the Godavari, Mahanadi, Krishna, and Kaveri. The mountain ranges run parallel to the Bay of Bengal. The Deccan Plateau lies to the west of the range, between the Eastern Ghats and Western Ghats. The coastal plains, including the Coromandel Coast region, lie between the Eastern Ghats and the Bay of Bengal. The Eastern Ghats are not as high as the Western Ghats. The Eastern Ghats are older than the Western Ghats, and have a complex geologic history related to the assembly and breakup of the ancient supercontinent of Rodinia and the assembly of the Gondwana supercontinent. The Eastern Ghats are made up of charnockites, granite gneiss, khondalites, metamorphic gneisses and quartzite rock formations. The structure of the Eastern Ghats includes thrusts and strike-slip faults all along its range. Limestone, bauxite and iron ore are found in the Eastern Ghats hill ranges. The Eparchaean Unconformity of the Tirumala Hills is a major discontinuity of stratigraphic significance that represents an extensive period of erosion and non-deposition. It is seen at the steep natural slopes, road scars and ravines in the Tirumala ghat roads in the Chittoor district of Andhra Pradesh. As with the Western Ghats, these mountain ranges also have local names along the discontinuous hill ranges. At their southern end, the Eastern Ghats form several ranges of low hills. The southernmost of the Eastern Ghats are the low Sirumalai and Karanthamalai Hills of southern Tamil Nadu. North of the Kaveri River are the higher Kollimalai, Pachaimalai, Shevaroy (Servarayan), Kalrayan Hills, Chitteri, Palamalai and Mettur Hills in northern Tamil Nadu state. The climate of the higher hill ranges is generally cooler and wetter than the surrounding plains, and the hills are home to coffee plantations and enclaves of dry forest. The hill station of Yercaud is located in the Shevaroy Hills. The Bilgiri Hills, which run east from the Western Ghats to the River Kaveri, form a forested ecological corridor that connects the Eastern and Western Ghats, and allows the second-largest wild Asian elephant population in India to range between the South Eastern Ghats, the Biligiri and Nilgiri Hills, and the South Western Ghats. The Malai Mahadeshwara Hills Temple is situated in Chamarajanagar district in Karnataka state in the Eastern Ghats. 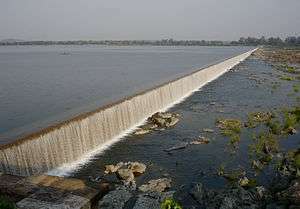 The Ponnaiyar and Palar rivers flow from headwaters on the Kolar Plateau eastward through gaps in the Ghats to empty into the Bay of Bengal; the Javadu Hills lie between the two rivers. There are waterfalls in remote areas, such as the Kiliyur Falls. Some 40 km from the south end of the Javadu Hills starts the Kalvarayan Hill range. The name Kalvarayan comes from the native people known as "kalvar". This hill range brings much more rainfall to the eastern part of its surrounding areas during the northwest monsoon. The Thenponnaiyar River divides this hill range from the Javadu Hills in the north. The hills continue as the Shervarayan Hills further southwest divided by Manchavaadi Pass. 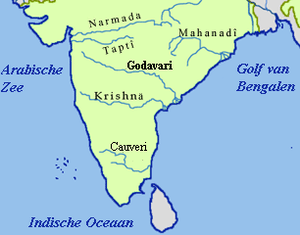 The Komuki River originates in this range and flows into the Bay of Bengal, along with the Kaveri River. North of the Palar River in Andhra Pradesh, the central portion of the Eastern Ghats consists of two parallel ranges running approximately north-south. The lower Velikonda Range lies to the east, and the higher Palikonda-Lankamalla-Nallamalai Ranges lie to the west. They run in a nearly north-south alignment, parallel to the Coromandel Coast for close to 430 km between the Krishna and Pennar rivers. Its northern boundaries are marked by the flat Palnadu basin, while in the south it merges with the Tirupati hills. An extremely old system, the hills have been extensively weathered and eroded over the years. The average elevation today is about 520 m, but reaches 1,100 m at Bhairani Konda and 1,048 m at Gundla Brahmeswara. 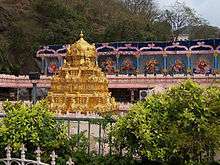 The Kondapalli Hills are a range of low hills which lie between the Krishna and the Godavari rivers. These hills are located in the Guntur, Krishna, West Godavari and Khammam districts of Andhra Pradesh. The Krishna River bisects these hills of the Eastern Ghats. The main hill range starts from Nandigrama to Vijayawada known as Kondapalli. The Papi Hills (Papi Kondalu) are distributed among the Khammam, East Godavari and West Godavari districts of Andhra Pradesh and lie in the Eastern Ghats. The Madugula Konda Range is located in the northern portion of the Eastern Ghats. The Madugula Konda range is higher than the Maliyas and generally ranges between elevations of 1100–1400 m. Prominent summits include the highest peak of the Eastern Ghats - Arma Konda (1680 m), Gali Konda (1643 m) and Sinkram Gutta (1620 m). 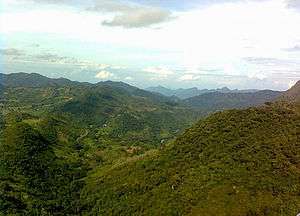 The highest mountain peak in the state of Odisha is Deomali (1672 m), which is situated in the Koraput district of southern Odisha. It is part of the Chandragiri-Pottangi mountain system. The region covers about three-fourths of the entire Odisha state. Geologically it is a part of the Indian Peninsula which was a part of the ancient land mass of Gondwanaland. The major rivers of Odisha with their tributaries have cut deep and narrow valleys. The Garhjat Range is a northeastern prolongation of the eastern Ghats which rises abruptly and steeply in the east and slopes gently to a dissected plateau in the west running from north-west (Mayurbhanj) to south-west (Malkangiri). The Odisha highlands are also known as the Garhjat Hills. This region is well marked by a number of interfluves or watersheds which interrupt the terrain in the form of broad and narrow river valleys and flood plains. The average height of this region is about 900 metres above mean sea level. The Similipal Massif is considered the farthest northeast extension of the Eastern Ghats. 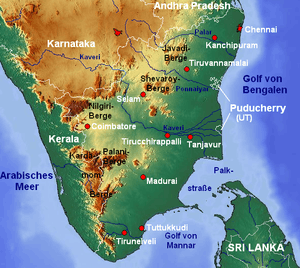 The Eastern Ghats are the source points for many small and medium rivers along the east coastal plains of South India. The Eastern Ghats consist of different ecoregions along its range from south to north along the east coast of India. 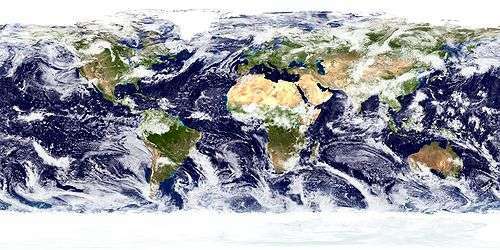 The important ecoregions consist of Eastern Highlands moist deciduous forests, East Deccan dry evergreen forests, Deccan thorn scrub forests, shrub lands, and South Deccan Plateau dry deciduous forests. The southern tropical thorn scrub type forests consist of open, low vegetation that is characterised by thorny trees with short trunks and low, branching crowns that rarely meet to form a closed canopy. Typical grasses of the ecoregion include Chrysopogon fulvus, Heteropogon contortus, Eremopogon foveolatus, Aristida setacea, and Dactyloctenium species. The plants that dominate the vegetation in these forests are acacia species, Balanites roxburghii, Cordia myxa, Capparis spp., Prosopis spp., Azadirachta indica, Cassia fistula, Diospyros chloroxylon, Carissa carandas, and Phoenix sylvestris. There are also several other habitat types found in these forests. Flora of medicinal and botanical interest include an endemic cycad (Cycas beddomei) and Psilotum nudum. 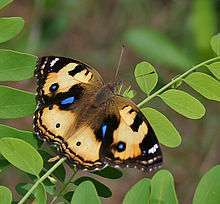 A small patch of the tree Shorea talura also exists within the Chittoor forest division, part of which is being maintained as a preservation plot by the Forest Department of Andhra Pradesh. The area between the Nallamalai and Seshachalam Hills is well known for the red sandal (Pterocarpus santalinus), a rare, endemic tree species that is harvested for the medicinal value of its wood. The Eastern Highlands moist deciduous ecoregion's forests are dominated by sal (Shorea robusta), in association with Terminalia, Adina, Toona, Syzygium, Buchanania, Cleisanthus, and Anogeissus. The flora of the ecoregion share many affinities with the moist forests of the Western Ghats and the eastern Himalayas. The original vegetation of the Deccan dry evergreen forests ecoregion consisted of forests with an understory of evergreen trees and an emergent canopy of taller deciduous trees, including sal (Shorea robusta), Albizia amara and Chloroxylon spp. Intensive human use of the forests over the centuries has mostly eliminated the deciduous canopy species, and the ecoregion's remaining forests are now characterized by areas of leathery-leaved evergreen forest, with a relatively low (10-metre) closed canopy. Predominant species are Manilkara hexandra, Mimusops elengi, Ceylon ebony (Diospyros ebenum), strychnine tree (Strychnos nux-vomica), Eugenia spp., Drypetes sepiaria, and Flacourtia indica. A few small enclaves of deciduous sal forest exist but are under intensive human pressure. Most of the ecoregion's forests have been degraded into tropical dry evergreen scrublands, characterized by thorny species such as Ziziphus glaberrima, Dichrostachys cinerea, Catunaregam spinosa, and Carissa spinarum. The endemic fauna of the Eastern Ghats are the Jerdon's courser (Rhinoptilus bitorquatus) and grey slender loris (Loris lydekkerianus). The rare geckos found here are the Indian golden gecko (Calodactylodes aureus), rock gecko (Hemiphyllodactylus aurantiacus), and Sharma's skink Eutropis nagarjuni. The Nallamalla Hills of the Eastern Ghats contain nearly 20 species of amphibians, including the marbled toad (Bufo stomaticus), Gunther's toad (Bufo hololius), Asian common toad (Duttaphrynus melanostictus), green pond frog (Euphlyctis hexadactylus), skittering frog (Euphlyctis cyanophlyctis), cricket frog (Fejervarya (Rana) limnocharis), Indus Valley bullfrog (Hoplobatrachus tigerinus), Indian burrowing frog (Sphaerotheca breviceps), painted frog (Kaloula taprobanica), ornamented pygmy frog (Microhyla ornata), and the common Indian tree frog (Polypedates maculatus). Endemic ones include the golden-backed frog (Hylarana) sp., the bush frog Raorchestes terebrans and the recently described caecilian Gegeneophis orientalis and an Ichthyophis species that is known from old records. The Nallamalla Hills contain 65 species of reptiles, including the mugger crocodile (Crocodylus palustris), Indian black turtle (Melanochelys trijuga), Indian flapshell turtle (Lissemys punctata), Indian tent turtle (Pangshura tentoria), Indian star tortoise (Geochelone elegans), Leith's softshell turtle (Nilssonia leithii), many of which are found in the northern rivers and riverine valley tracts. Among lizards are the Roux's forest calotes Calotes rouxii, those of the genera (Psammophilus ), (Sitana), Indian chameleon (Chamaeleo zeylanicus), Reticulated gecko (Hemidactylus reticulatus), the rock geckoes Hemidactylus giganteus, Hemidactylus graniticolus, the golden gecko (Calodactylodes aureus), the slender gecko (Hemiphyllodactylus aurantiacus), the rare ground geckoes (Geckoella nebulosa), (Geckoella collegalensis), the recently rediscovered (Geckoella jeyporensis), Leschenault's snake-eye (Ophisops leschenaultii), Blinking snake-eye (Ophisops minor), Ashwamedh's writhing skink (Lygosoma ashwamedhii), Beddome's skink Eutropis beddomei, Nagarjun's skink (Eutropis nagarjuni) and Bengal monitor (Varanus bengalensis). Noteworthy lizards include the endemic, fossorial genera of leg-less skinks such as Sepsophis punctatus, Barkudia melanosticta and Barkudia insularis that are known only from the northern ranges and along the adjoining Eastern coastal plains in northern Andhra Pradesh and Odisha. Among snakes are the beaked worm snake (Grypotyphlops acutus), the endemic shield-tailed snakes like Uropeltis ellioti, Uropeltis shorttii, the recently described Rhinophis goweri, the endangered Indian rock python (Python molurus), Forsten's cat snake (Boiga forsteni), yellow-green cat snake (Boiga flaviviridis), Srilankan flying snake (Chrysopelea taprobanica), Nagarjun Sagar racer (Coluber bholanathi), green keelback (Macropisthodon plumbicolor), Duméril's black-headed snake (Sibynophis subpunctatus), Indian reed snake (Liopeltis calamaria). Apart from the Big Four Indian venomous snakes, endemic ones like the Beddome's coral snake (Calliophis beddomei) and the Indian green Bamboo pit viper (Trimeresurus gramineus) and the rare King cobra (Ophiophagus hannah) and the Banded krait (Bungarus fasciatus) are also known from parts of this region. Coffee was first introduced in Andhra Pradesh in 1898 by Mr. Brodi, a Brtisher in Pamuleru valley in East Godavari district. Subsequently it spread over to Pullangi (East Godavari district) and Gudem (Visakhapatnam district) agency tracks. In 1920s even though it spread over to Ananthagiri in Araku valley and Chintapalli areas, coffee cultivation remained dormant for a long time. In 1960s, the Andhra Pradesh Forest Department developed coffee plantations in 10100 acres in Reserve forest areas. These plantations were handed over to the A.P. Forest Development Corporation in the year 1985. In the year 1956 after the formation of Girijan Cooperative Corporation (GCC), the Coffee Board identified GCC for promoting coffee plantations. Since then GCC started making efforts to develop coffee plantation through local tribal famers. A separate coffee wing was carved out in GCC and promoting coffee in around 4000 hectares taken up. Thus, the coffee grown in Araku valley by the tribal farmers under organic practices attained recognition as “Araku coffee”. After 1985, GCC promoted another organization by name “Girijan Coop. Plantation Development Corporation” (GCPDC) exclusively to develop coffee plantations in tribal areas. All the plantations developed by GCC and GCPDC were handed over to the tribal farmers @ 2 acres to each family. In July, 1997 the employees working in GCPDC were deployed to ITDA and coffee expansion was taken up under Five year Plan and MGNREGS. The Eastern Ghats are home to many Buddhist ruins, from Odisha to South Andhra. 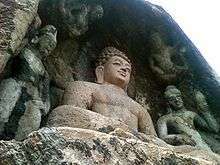 Andhra Pradesh has 140 listed Buddhist sites, which provide a panoramic view of the history of Buddhism from the 3rd century BCE to the 14th century CE. There are as many as 501 inscriptions engraved upon various media, including lithic, copper plates, crystals, pots, and conch, of which 360 are lithic records, 7 are sets of copper plates, and 134 are inscribed pots and conches. Wikimedia Commons has media related to Eastern Ghats. ↑ Kenneth Pletcher (August 2010). The Geography of India: Sacred and Historic Places. The Rosen Publishing Group, 2010. pp. 28–. ISBN 978-16-1530-142-3. Retrieved 4 July 2013. ↑ "Geology of Eastern Ghats in Andhra Pradesh" (PDF). Proceedings of the Indian Academy of Sciences - Section B. 66 (5): 200–205. November 1967. doi:10.1007/BF03052185. ↑ "Eparchaean Unconformity, Tirumala Ghat section". Geological Survey of India. Retrieved 2009-09-20. ↑ Geological Monuments of India. Eparchaean Unconformity (Tirupati Tirupati Road). Geological Survey of India. 2001. pp. 5–8. ↑ "Jungle Look". Chennai, India: The Hindu. 2006-02-11. Retrieved 2006-12-09. ↑ Jagadeeswara Rao, P.; Harikrishna, P.; Srivastav, S.K. ; Satyanarayana, P.V.V. ; Vasu Deva Rao, B. (October 2009). "Selection of groundwater potential zones in and around Madhurawada Dome, Visakhapatnam District - A GIS approach" (PDF). J. Ind. Geophys. Union. 13 (4): 191–200. Retrieved 4 April 2014. 1 2 M.S. Kohli (August 2010). 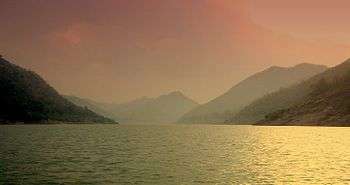 Mountains of India: Tourism, Adventure and Pilgrimage. Indus Publishing, 2014. pp. 36–. ISBN 978-81-7387-135-1. Retrieved 4 July 2013. ↑ Flora of Eastern Ghats: Hill Ranges of South East India - Thammineni Pullaiah, D. Muralidhara Rao, K. Sri Ramamurthy - Google Books. Books.google.co.in. Retrieved on 2013-07-28. ↑ Endangered vultures sighted in Raichur. The Hindu (2012-08-29). Retrieved on 2013-07-28. ↑ Critically endangered vulture found in Adilabad district. The Hindu (2013-06-05). Retrieved on 2013-07-28. 1 2 Archived May 6, 2012, at the Wayback Machine.